Select country UK (including BFPO)	Austria	Bahrain Balearic Islands	Belgium	Bulgaria	Canada Czech Republic	Denmark	Estonia	Finland	France	Germany	Greece	Hong Kong Hungary	Ireland (ROI)	Italy	Kuwait Latvia	Lithuania	Luxembourg	Monaco	Netherlands	Norway	Poland	Portugal	Qatar Romania	Saudi Arabia Singapore Slovakia	Slovenia	Spain (mainland)	Sweden	Thailand USA	United Arab Emirates Can't find country? Please note that changing your country whilst shopping will remove all items from your basket. The item can be delivered to all addresses within the UK. Northern Ireland and to BFPO addresses. 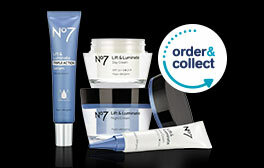 Collect in store for free is available from 2300 Boots stores across the UK. Usually delivered within 4 working days 8am - 9pm Mon - Fri. *Free delivery on orders over £45 in a single transaction excluding gift boxing, infant formula, other shops and Boots services (insurance and opticians). Orders containing bulky/heavy items or super heavy items are not available for free delivery. Please see details below. **Pre-orders will be delivered within 4 working days after stock arrives in our warehouse. You can select a named weekday up to 14 days in advance for your order to be delivered. Usually between 8am-9pm. Available on orders placed before 7pm. Orders placed after 7pm Mon - Fri or anytime Sat/Sun will not be delivered next day. The earliest delivery date for these orders will be shown at the checkout. Next day delivery is not available on medicines, these are shown with the green pharmacy cross symbol. Usually delivered between 8am -9pm. Usually delivered between 8am and 9pm. Orders must not contain aerosol products or bulky/heavy items. Boots.com deliver to British Forces Post Office addresses. The charge for BFPO delivery is £6.00, this includes the cost of delivering your parcel to the BFPO sorting office and the charge applied for delivery to your address. We can't ship aerosols to BFPO addresses. Aerosols will be intercepted and returned to us. Please also note that certain areas carry specific weight restrictions and parcels over these weight limits are automatically returned to us. Orders containing bulky/heavy items are not available for free delivery or collect from store and are usually delivered within 5 working days. Orders containing super heavy items are not available for free delivery or collect from store. Normally these items will be delivered to you within 5 working days, but for large items you may be contacted by the supplier to arrange a mutually convenient delivery date and time. However you like to shop we've got you covered, from placing an order in-store or by phone to shopping online and through our app. Prices may vary depending on the store. Availability is an indication only and is updated every 30 minutes.